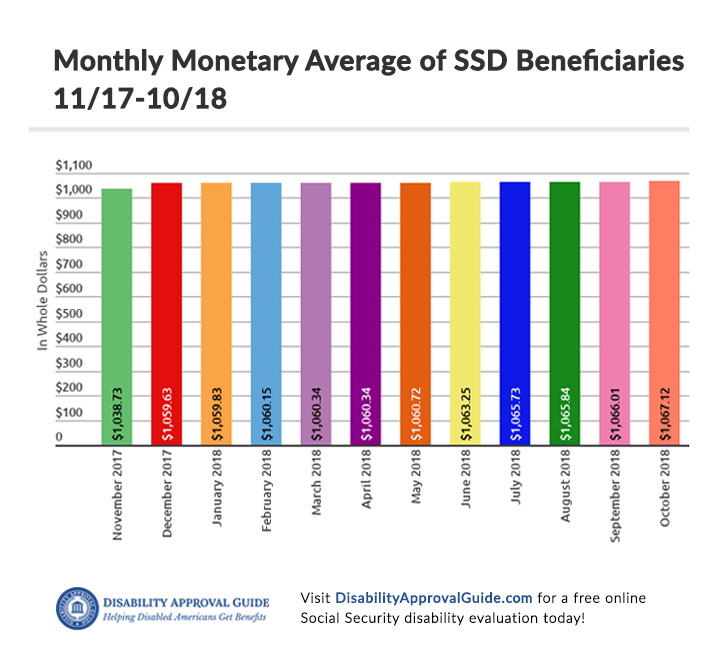 The October 2018 SSD benefits statistics are here from the Social Security Administration so let’s break down the numbers. Each month, the SSA’s newest report shows how beneficiary categories and dollar amounts changed in the last 30 days. We track these statistical reports to help you compare your own SSD benefits against the national average. Below, we’ll explain how payments for disabled workers, their spouses and children changed since last month’s update. Wow, the October 2018 SSD benefits statistics report shows 42,000 fewer beneficiaries than last month! We haven’t seen a single-month drop in SSD claimants like that since July 2014. There are now 37,000 fewer disabled workers in active-payment status compared to September’s report. The spousal category lost another 1,000 claimants, the same amount that we noted last month. The October 2018 SSD benefits report also shows 5,000 children struck from the disability rolls in the last 30 days. The SSA removes any claimants who find work, reach full retirement age or pass away before publishing the next report. In addition, the SSA conducts audits looking for suspicious and fraudulent activity from month to month. Anyone caught illegally collecting disability benefits is also removed — and forced to repay every penny. Once again, everyone listed in the October 2018 SSD benefits report got paid more money than last month. First up are the dependent children, who enjoyed a $1.36 raise compared to September. Disabled workers are next, with another $1.24 added to this month’s payments. Spousal claimants got just $.30 more compared to last month, raising total average payment amount by $1.11 for October. We expect to see claimant numbers and average check amounts increase significantly right around the holidays. If you haven’t already filed your Social Security disability benefits claim, don’t wait — do it now and beat the rush! This is the best time of year for getting your claim approved. Plus, the SSA’s 2.8% COLA increase goes into effect just after the New Year. Is your handwriting clear and easy to read? Are you comfortable having a stranger at the SSA office fill out your application? Right now, 2 in every 5 first-time filers get denied benefits for basic errors on their forms! If you can’t afford to wait an average 17.4 months to appeal after you’re denied, why risk it? A Social Security attorney can help you file your claim for free and ensure everything’s filled out correctly. If your first benefits application got turned down, attorneys can help you schedule an appeal hearing much faster. All Social Security lawyers work on contingency, so you’ll never pay any fees unless they help you win benefits. And if you do win, you’ll only pay a small, one-time fee. Legal assistance can help you get paid the most benefits you’re owed faster than you would filing on your own.